Currently, the new 52°North SOS version 4.x supports data storage for many different Database Management Systems based on Hibernate, such as Postgres/PostGIS, Oracle/Oracle Spatial, or Microsoft SQL. create Rasdaman-Hibernate mappings for 52°North SOS, e.g. by implementing a generic Rasdaman JDBC driver. My project deals with the enviroCar Android application. The application connects with your car through an OBD bluetooth adapter and measures CO2 emission, fuel consumption, engine load and several other parameters. The parameters, such as CO2 emission and speed, are plotted in a chart against all the users who also use the enviroCar application. This helps to decide how ‘sustainable’ a driver you are (as shown in the image below). The data collected for a city can be used for showing CO2 hot spots in that city. 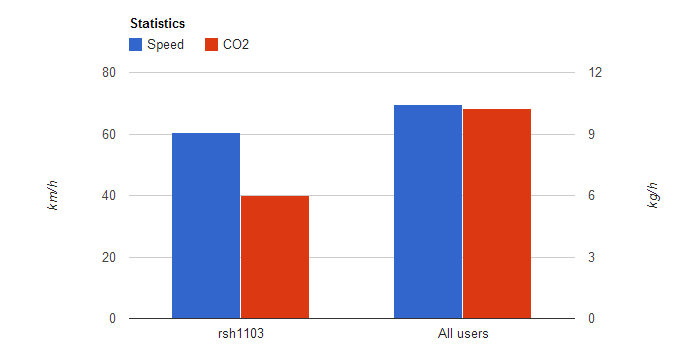 The image shows the comparison of speed and CO2 emission between a single user and the rest of the users. 3. Inserting, deleting and reading the observations of the sensor etc. There is no graphical permission editor through which we can control which user role can access which parameters. Through the interface the admin should be able to grant and revoke rights for different parameters to the roles already defined. An example use case of access control would be that users assigned the role “guest” should only be able to get the capabilities of the sensor and not insert/delete observations.